Here’s a list of 5 free time tracking software for Windows 10 which you can use to get a better handle of your time. Whether you are a freelancer working for clients or a student trying to mange time more efficiently, time tracking is very important. Applications from the list down below are simplistic, lightweight, standalone time tracking applications that you can use to keep track of time spent working on a certain task. Let’s have a look at what exactly it is that’s available. 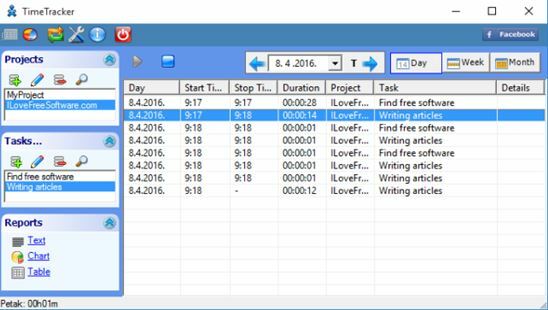 Timetracker is a very small but feature rich time tracking software for Windows 10 where you can setup multiple tasks and track time spent working on each task individually. There’s even a rudimentary project management functionality, which basically boils down to combining tasks into a specific project. By adding tasks to projects you’re basically grouping tasks. Each project can have a list of tasks of its own. Left sidebar lets you create both projects and tasks. Task is added to the list of active tasks only after you double click on it from the sidebar. On top of the list you have buttons for stopping and running tasks. Time can be tracked for 1 task at a time. Stats and data exports as text, charts and tables is possible. System tray icon is available and it’s animated once a task is active. Baralga is a time tracking software that’s in a lot of ways similar to Timetracker. It offers time tracking and it’s simplistic. Tasks are here called activities. Each activity that you add has be assigned to a project. Time tracking is started by pressing on the “Play” button. Setting up a project is a must before activities can be added. Use the top “Add project” button from the toolbar to add at least 1 project to be able to use Baralga. Exports of data as Excel, CSV and iCalendar are possible. Icon is also available in the system tray, for quicker access and easier monitoring. Also have a look at Online Time Tracking Tool for Complete Organization: Everhour. Rachota is a small and portable time tracking software that has a surprisingly large selection of features. For comparison sake, Baralga is close to 40MB in size, while Rachota has less than 1MB. Main features of Rachota that make it standout are detailed analytics (with graphs, bar charts and analysis), detailed history logging (spent time working, completed tasks, etc.). To start keeping track of a particular task, you first need to add it to the list, by clicking on the “Add” button. Once you’ve added task details like name, details, you can then click on the “Work” button for the timer to start. “Relax” button pauses the task and “Done” marks it complete. Completed tasks are added into the history tab up top. Time Tracking Tool is another portable and small (around 1MB in size) time tracking software that keeps things simple. Interface has a menu/toolbar in the top left, and the rest of the interface down below is where the task list resides. Before time tracking can start, you need to add at least 1 task to the list. With the task added, you can hit the “Play” button which starts time tracking for the selected task. Task pausing is available. This allows you to pause a task when you need to take a break. Deactivating task means stopping the timer. 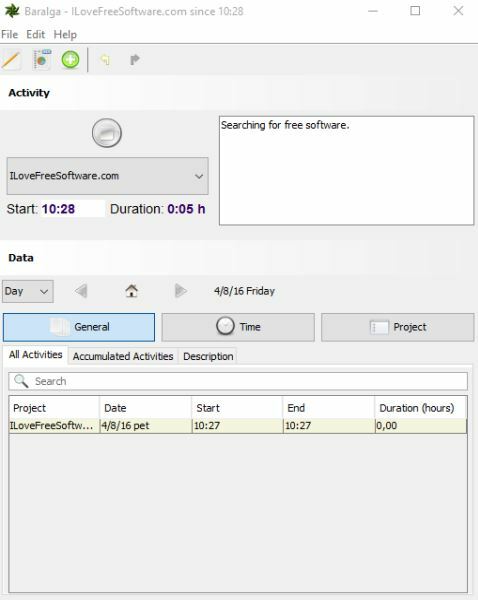 Detailed stats on time spent working for a single task, or all the tasks together can be generated and saved as TTT, SAV or BAK file format. Also have a look at Work Time tracking, create Projects, add Team, Track their Time. ManicTime has a whole new take on time tracking. This applications doesn’t require you to add task titles and descriptions. Instead it starts automatic tracking of the time within a certain application, the time that it was active. 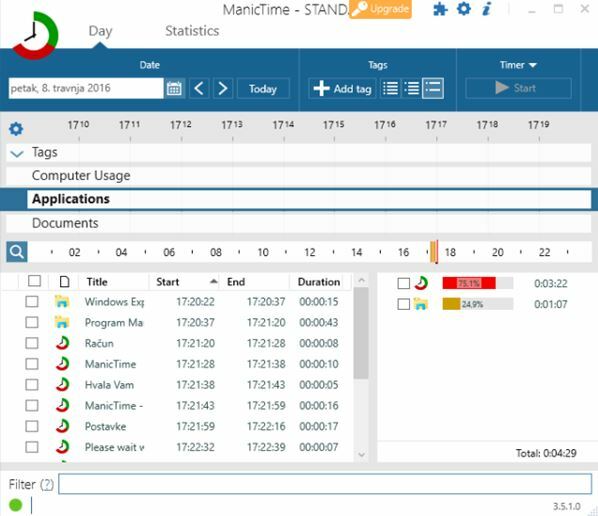 ManicTime even has the ability to differentiate between opened documents in the same application, so if you have 3 text documents open inside Notepad++, it will keep track of time spent with each opened document separately. Overall computer usage is also tracked (using mouse/keyboard activity). Statistics tab keeps all the data for detailed analysis later on. Free version works as a standalone application only. Paid license also gives you access to a server variant of ManicTime, to which clients then connect and report usage stats. This can especially come in handy when managing teams, to keep tabs what your team members are doing. Out of the 5 time tracking software for Windows 10, I have to say that I really enjoyed using Timetracker and Rachota. These are my picks mainly because they offer simplistic time tracking functionality, and they are both lightweight. I especially like the system tray icon, which allows you to put away the application to the tray so it’s not in the way. ManicTime has a unique way of keep track of time, it’s definitely worth checking out. Let me know what you think in the comments down below.